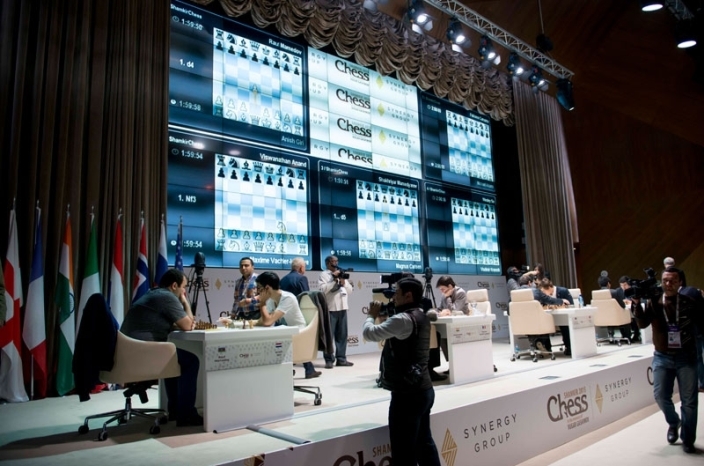 Magnus Carlsen smoothly outplayed Shakhriyar Mamedyarov in Round 2 of the 2015 Shamkir Chess tournament to join Vladimir Kramnik and Wesley So in the lead. All the other games were drawn, though none was entirely without interest. 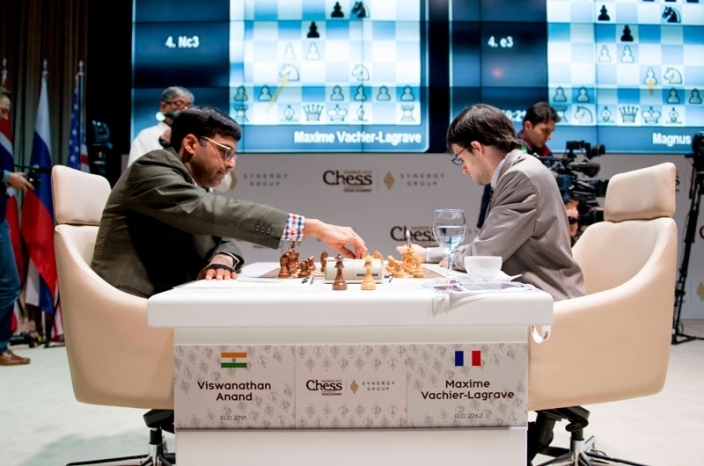 So survived his first encounter with Kramnik, Vishy Anand learned from Spassky’s mistakes to hold Maxime Vachier-Lagrave, while Anish Giri’s attempts to beat outsider Rauf Mamedov were blunder-strewn and ended in an amazing oversight by his opponent. Carlsen 1-0 Mamedyarov: Who needs orange juice? For once there’s no question which was the standout game of the day. 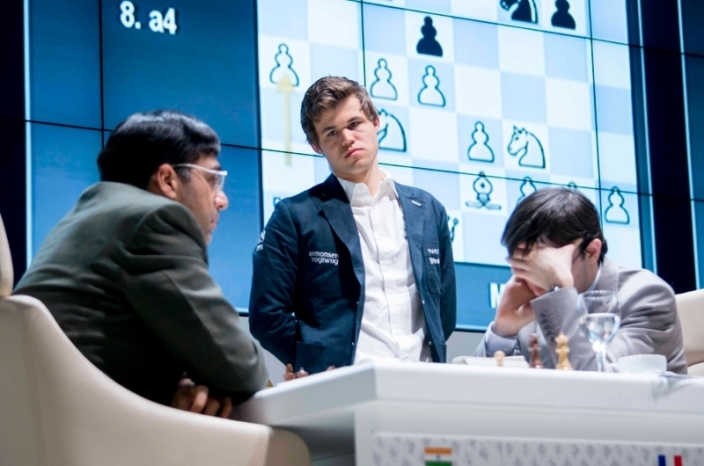 Carlsen seems to have limited his traditional shaky start to a supertourament to the first half of his game against Anand in Round 1, while in Round 2 he exploited an opening mistake from Mamedyarov with ruthless efficiency. 1. d4 d5 2. c4 c6 3. ♘f3 ♘f6 4. e3 g6 The Schlechter Variation, a combination of the Slav and the Grünfeld, has the dubious honour of being the opening I find dullest, surpassing even the Bogo-Indian. The extremely closed positions that usually arise lead to manoeuvring games where there's little contact and even less to watch. Despite all that, I have to say that as an option to play against a 2863 player it strikes me as more than acceptable. 8... a6 and involves the idea of meeting 9. a5 with 9... b5 and then e6... and then moving the knight to play f6 or f5... And even Carlsen would struggle to break through That's been employed successfully by Chinese players such as Li Chao, Ni Hua and Wang Hao, hence my "inspired" idea of calling it "The Great Wall of China"! 9... ♘xd5 is another option, but after 10. e4 ♘b4 11. ♗e3 White is a little better. This was one of the Chinese attempts before they discovered that 8...a6 is much more boring effective. 10... ♗b7 11. ♗a3 ♘c6 12. ♖c1 ♖c8 followed by Re8, e6 and Bf8. White can put his knight on e5, followed by f4, and claim a slight advantage, but the black position would still be difficult to break down. 11. ♘xe4 dxe4 12. ♘d2 ♗b7 13. ♗a3 White's moves are easy for the moment, since his pieces have perfect squares: the bishop on a3, the rook on c1 and the knight on c4. 14... ♗d5 In that case I think Carlsen would first have opted to exchange the blockader with 15. ♗c4 and then break open the black centre, either with f3 or even with g4. In any case, that would have made White's life a bit harder than it was in the game. 15. ♘c4 ♘d7 16. d5! The white pieces are perfectly prepared for action. 16... ♖c8 17. d6 e6 Mamedyarov attempts to keep the position closed, but with a pawn on d6 that's far from easy. 18. b4! Opening up the queenside is now decisive. 18... axb4 19. ♗xb4 ♗d5 20. a5! bxa5 21. ♗xa5 ♕e8 22. 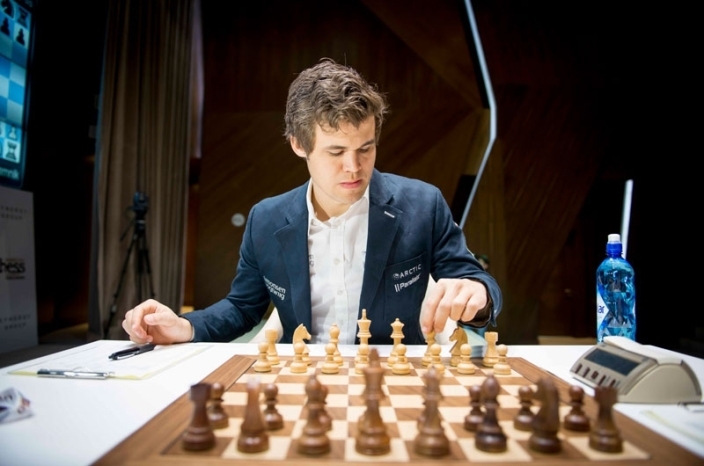 ♕a4 With his habitual composure, Carlsen keeps putting his pieces on their best squares. 22... ♗c6 23. ♕b4 ♖b8 24. ♘b6 ♘e5 25. ♕c5 The picturesque position of the white pieces on a5-b6-c5-d6 speaks for itself. Black is under lock and key. 25... ♗a8 26. ♗c3 ♘d7 27. ♗xg7+ ♔xg7 28. ♘xd7 ♕xd7 29. ♕e5+ With Rc7 coming next. The ease with which Carlsen won this game while "doing nothing" is impressive. You only appreciate the difficulty of such a game when you realise that he defeated someone rated over 2750 in this manner... It's only easy for him! It’s a simple matter. I’m not drinking orange juice anymore! And now for the draws. 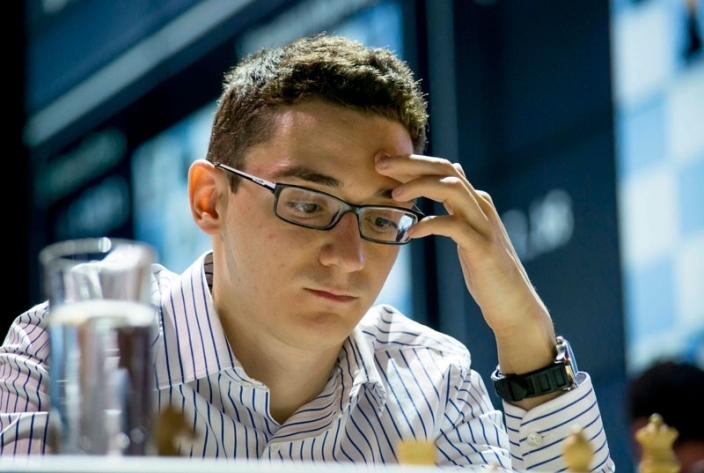 Adams 1/2 - 1/2 Caruana: "The Berlin is a pretty solid opening..."
The Berlin is a pretty solid opening anyway, so it’s not clear how to attack it. Kramnik 1/2 - 1/2 So: Boring and cautious chess? Kramnik said he’d had the position after 11.Bxe4 in his preparation, but had stopped there at a general assessment that it was “a little bit better for White”. The worst thing that can happen in chess is that you lose, which isn’t the end of the world. Why be afraid? I’m not trying to play cautious chess, it’s just that my chess is boring and cautious – what can I do? Wesley, who spent a long time analysing the game with his opponent both at the board and in the press conference, also rubbished the suggestion, pointing out that he’d been under heavy pressure and “somehow I managed to defend with exact play”. 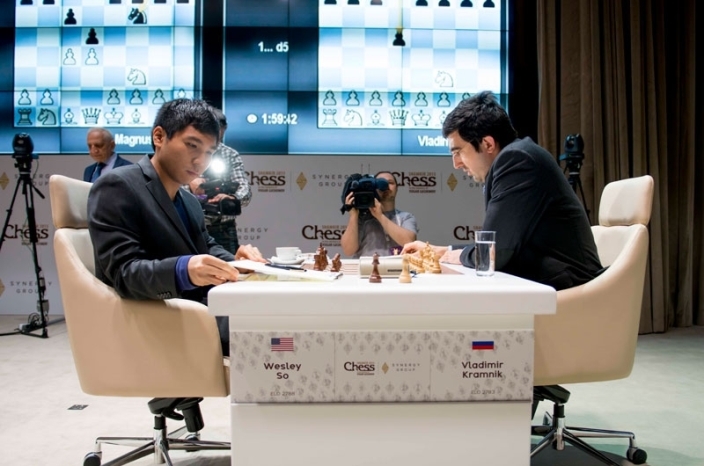 The players went on to explain why they’re not representing their countries in the World Team Championship that starts tomorrow – So had agreed to play in Shamkir before it was known the US would play, while Kramnik felt his presence wasn’t critical to Russia’s chances of success and had wanted to play in Azerbaijan both because of Vugar Gashimov and what he’d heard of the tournament’s organisation. Maxime Vachier-Lagrave and Vishy Anand took longer to draw, but made a dash for the press conference room before Kramnik and So could finish analysing. Their game was a potentially dramatic encounter that never quite caught fire. I felt I was well-prepared, but then 7...Bf5 came on the board and suddenly I didn’t know anything. At least I was aware of the problem, so I thought I wouldn’t allow it so smoothly. …it only led to the rapid liquidation of the whole queenside and a draw. The final game to finish was a very strange affair. There was no doubt Anish Giri saw it as a must-win game to have White against the rank outsider, especially after his Round 1 disaster, but he went astray and was hit by 23…g5! It’s a little painful for me to show critical moments because at all critical moments I made mistakes. At other critical moments I escaped. I hope it will be a good wake-up call for me, also literally, because I felt a bit sleepy throughout the game, but it’s no excuse for playing badly. The only thing I’m thinking just now is 56…Nxf4 - how could I have missed that move? Of course Giri would still almost certainly have drawn, but he admitted it would have been no fun to play on without pawns. So a relatively quiet day leaves us with three leaders on 1.5/2, Kramnik, So and Carlsen, and three players tied in last place on 0.5/2, Giri, Mamedyarov and Adams. Don’t miss the show live here on chess24 from 12:00 CEST each day.